For seventeen year old Dahlia Winters, this is her truth. Her coping mechanism is to simply forget and deny the strangeness that is her life. Orphaned, her past remains a mystery. Now residing with a foster family, she finally feels normal, or attempts to. Yet, dreams continue to torment her. Not only consumed by visions of miraculously healing wounds, but of a lust for something she should never naturally crave. Then a green eyed stranger enters her life echoing her inner thoughts and voicing warnings about others wanting to harm her. He knows things about her that no one should possibly know, and he awakens her in ways she never expected. This leads Dahlia to discover who she really is, for she is more than just human. With this new found knowledge, and the elements suddenly fighting against her, she finds it hard to trust anyone. And as she finally awakens and comes to grips with the power she possesses, she fights to stay alive. Dahlia has never known her true family or where she came from. She's been the product of a dismal foster care system, but always returning to the orphanage where she was first found. She can't remember anything from the age of five, when she was abandoned by those who were supposed to love her. Dahlia knows she's not the average teenage girl. She has unexplained scars, the scent of blood smells like an appetizer and she can heal others... And herself. She's being watched, her developing abilities have made Dahlia a target to those who wish her harm, or worse. When the tall, dark and handsome Grayson claims he can help her understand what she really is, Dahlia knows she needs to accept that she isn't quite... Human. Grayson has become obsessed with Dahlia, the girl he was sent to keep surveillance of until she comes into her abilities. He watches her, becoming infatuated by here mere presence. He knows it's a mistake to feel anything for the girl that is essentially a pawn in the battle against the Lapsus and Lamia, Fallen Angels and Vampires. Dahlia is a unique take on the history or vampires and fallen angels and their abilities. Dahlia is a likeable character, she's been a foster child in the system since the age of five, and can't remember anything of her life before the orphanage. She understands that she isn't like other children, at times she believes she may be mentally ill. You'll find yourself empathizing with Dahlia. She is a lost soul, trying to find her place in the world. Well paced and unique storyline. 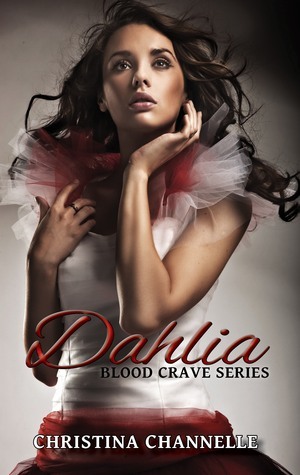 I really enjoyed Dahlia and looking forward to starting Fallen Tears, the Blood Crave novella.